(a) To determine the quantity and quality of behavioral problems in older hospitalized patients on acute care units; (b) to determine the burden of these behaviors on staff; and (c) to identify predictors of behavioral problems. Upon admission, patients performed the Mini-Mental State Exam (MMSE), the Geriatric Depression Scale (GDS), and information was obtained on age, ethnicity, level of education, living arrangement, and psychiatric history. Two days post-admission, a clinical staff member caring for each patient, performed the Neuropsychiatric Inventory-Questionnaire (NPI-Q) to assess patients' behavioral problems and staff distress. Forty-two patients, over 60 years of age, admitted to medical and surgical units of the Veterans Affairs Hospitals in Palo Alto and San Francisco, participated. Twenty-three of 42 (55%) patients exhibited behavioral problems. Anxiety, depression, irritability, and agitation/aggression were the most frequently observed behaviors. The severity of the behavioral problems was significantly correlated with staff distress. Lower performance on the MMSE at admission was significantly associated with higher NPI-Q ratings. Specifically, of those cases with scores less than or equal to 27 on the MMSE, 66% had behavioral problems during hospitalization, compared to only 31% of those with scores greater than 27. Behavioral problems in older hospitalized patients appear to occur frequently, are a significant source of distress to staff, and can result in the need for psychiatric consultation. Assessment of the mental status of older adults at admission to hospital may be valuable in identifying individuals at increased risk for behavioral problems during hospitalization. In a recent investigation, Sourial et al. found that a high proportion of dementia patients exhibit agitation and other behavioral problems in acute care hospital settings, and that these behaviors are associated with significant burden on staff. The literature suggests that older patients, in general, admitted to acute care units may be at increased risk for behavioral problems [2–5]. In a multisite investigation of acute care settings, Minnick et al. found that older patients were more likely to be physically restrained than younger patients. Additionally, they found that the dominant rationale for the use of restraints in this population was patients disrupting their own treatment, rather than prevention of falls. Older patients admitted to the hospital, in addition to being ill, fatigued, or in considerable physical or mental distress, are suddenly faced with stimuli levels far above those in their home settings. Their environment, families, caregivers, and daily routines are all drastically altered from what they know. With such stressors and changes in environment, behavioral problems and/or cognitive impairment may occur [7, 8]. Hospital staff and family members may be faced with a patient who was cooperative and attentive at home but is now increasingly combative [7, 9, 10]. Combative patients may require chemical or physical interventions and in-hospital psychiatric consultation. While several studies have focused upon the onset of delirium and functional decline in hospitalized older adults, there are few investigations of behavioral problems in this population. Typically such behaviors are discussed within the context of restraint use, but behavioral problems are not limited to combative behaviors, which necessitate restraint. Sleep disturbance, anxiety, and irritability are among a broad range of behaviors that can negatively impact staff, patient, and treatment . Given the bourgeoning population of older adults, the number of hospitalized elderly adults will continue to increase in the coming decades. The National Health Interview Survey reports that in the United States in 1994, 8.3 million individuals over 65 years of age were discharged from hospitals, and accounted for over 30 percent of all discharges . Agitation or other behavioral problems in this population could have significant negative consequences for staff and patients. Indeed, in our recent investigation of clinical staff on acute care units, staff self reported that such behavioral problems were often encountered and of significant burden . Yet, to date, little is known about the prevalence of agitation and behavioral problems in older patients in acute care settings. The objectives of this study were to (a) determine the quantity and quality of behavioral problems in older hospitalized patients on acute care units, over the first two days of hospitalization; (b) determine the impact of these problem behaviors on nursing staff; and (c) investigate whether there are predictor variables, which could be easily assessed by clinicians at admission, that may place older adults at increased risk of developing behavioral problems in this setting. Forty-two patients at the Veteran's Affairs hospitals in Palo Alto (n= 19) and San Francisco (n = 23), California participated in this study. Patients were admitted to either medical or surgical units depending on their diagnosis and the care they required. Patients had a broad range of diagnoses from orthopedic problems to prostate cancer. Overall, patients in the current study were admitted to one of four units at each site. These were standard acute care units, ranging from 12 to 26 beds per unit. Patients over sixty years of age, admitted to these units were approached for participation in this study. If the patient had a caregiver(s), the caregiver(s) were also asked to participate in the study. All patients and caregivers provided informed consent before participating. All of the patients were male. The patients ranged in age from 61 to 85 years, with a mean age of 72 (SD = 6.5) years, and had an average of 13.3 (SD = 3.0) years of education. With respect to ethnicity, 30 patients were Caucasian, 9 were African American, 1 was Hispanic, 1 was Asian Pacific, and 1 was unreported. Ten patients lived alone, and 19 patients had a past history of psychiatric disorder. Only five patients had a history of alcohol abuse, as indicated by self-report and chart review. At baseline, patients had a mean MMSE of 24.8 (SD = 5.1) and a mean GDS of 3.6 (SD = 2.6). There were no significant differences between the two sites with respect to basic demographics or values on the MMSE and GDS at admission. Five patients approached refused to participate. Although this represents too small a number to conduct quantitative analyses, they had similar age-range, gender and range of illnesses as participants. However, since these individuals did not participate in the study we were unable to compare them in terms of pain, level of depressive symptoms or cognitive status. This questionnaire was developed and cross-validated with the standard NPI to provide a brief assessment of neuropsychiatric symptomotology and behavioral problems . The NPI-Q is used to measure 12 categories of behavioral disturbance, in particular: 1) Delusions, 2) Hallucinations, 3) Anxiety, 4) Depression/Dysphoria, 5) Agitation/Aggression, 6) Elation/Euphoria, 7) Disinhibition, 8) Irritability/Lability, 9) Apathy/Indifference, 10) Motor Disturbance, 11) Nighttime Behavior Problems, and 12) Problems with Appetite/Eating. The NPI-Q is completed by a caregiver (in this case a clinical staff member) and asks whether the patient exhibits each of the above behaviors. The caregiver then ranks the severity of the behavior exhibited on a scale of 1 to 3, with 3 being the most severe. The NPI-Q yields a total severity score, for the patient, which is the sum of the severity scores obtained for each behavioral category. Additionally, the caregiver ranks their level of distress from each behavior, on a scale of 1 to 5, with 5 indicating the most severe level of distress. The NPI-Q yields a total distress score, which is the sum of the distress scores obtained for each behavioral category. The NPI-Q takes approximately 10 minutes to administer. In the current study the caregiver was a member of the nursing staff caring for the patient during the first two days of hospitalization. The MMSE is a brief mental status examination designed to quantify cognitive status by assessing performance on the following cognitive domains: orientation; language; calculation; memory; and visuospatial reproduction . A score of 23 or less (maximum = 30) is generally considered evidence of cognitive impairment. This measure takes approximately 10 minutes to administer. The 30-item GDS is a widely used depression screening device specifically designed for the elderly . A yes/no format was purposely chosen for ease of administration. The GDS has high internal consistency and high test-retest reliability . The GDS can be completed in approximately 10 to 15 minutes. A score of 11 or higher is indicative of depression. Patients over sixty years of age were contacted upon admission on all units involved in the study. In order to assess for agitation and/or behavioral problems, we employed the NPI-Q. Several studies have suggested that patient charts do not always adequately report the occurrence of behavioral problems in acute care settings, and only the most severe problems are likely to be documented [18–20]. We felt that the NPI-Q would provide a more objective and reliable assessment of the extent of behavioral problems in this population. In addition to providing an assessment of behavioral problems, the NPI-Q also provides an assessment of the direct care staffs' level of distress specific to each behavior. In the current study, the NPI-Q was administered two-days post-admission to a clinical staff member caring for each patient. We chose to administer the NPI-Q two days post-admission because a significant number of patients on these units are most likely to be discharged or transferred two days post-admission. Additionally, at two-days post admission we were able to identify staff members who had similar levels of exposure to the patients in the study. In order to assess whether there are patient variables which might predict the subsequent occurrence of behavioral problems during hospitalization, we aimed to include variables for which information is either routinely acquired at regular patient visits or which could be easily assessed by clinicians at admission. We obtained information at admission on the following variables: age, ethnicity, level of education, and living arrangement. We assessed history of substance abuse and psychiatric illness, by both obtaining information from the patient themselves and by reviewing patient charts. We also included brief measures of mental status and mood because prior research has suggested an association between these domains and the occurrence of behavioral problems in older adults in long-term care and other settings [21–24]. Thus, at admission, patients were also administered the MMSE and the GDS. First, we determined the quantity and quality of behavioral problems in older hospitalized patients on acute care units, over the first two days of hospitalization. Twenty-three of the 42 patients (55%) had at least one behavioral problem as indicated by ratings on the NPI-Q. Overall, these 23 patients exhibited a total of 51 behavioral problems. 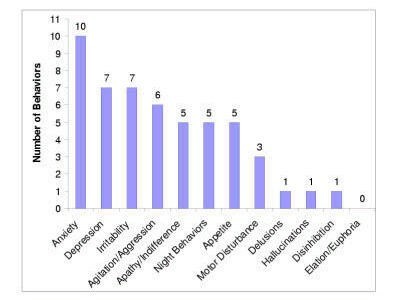 Figure 1 presents the number of behaviors exhibited in each of the different behavioral domains assessed by the NPI-Q. Anxiety, depression, irritability, and agitation/aggression were among the most commonly observed behaviors, respectively. Table 1 presents the behavioral problems exhibited by each patient. Ten patients (24% of all participants) exhibited one problem behavior; 5 patients (11% of all participants) exhibited 2 behavioral problems and 8 patients (19% of all participants) exhibited 3 or more behavioral problems. The mean severity rating on the NPI-Q for all 23 patients exhibiting behavioral problems, was 3.9 ± 4.0 (range 0–18); mean distress = 2.8 ± 2.9 (range 0–30). However, this reflects the fact that the NPI-Q severity and distress scores are cumulative over all behavioral categories for each patient. The mean level of severity for all 51 behavioral problems is 1.70 ± .78 (range 1–3); and the mean level of distress for all 51 behavioral problems is 1.34 ± 1.75 (range 0–5). This suggests that the behavioral problems exhibited were of moderate severity, resulting in mild to moderate distress to staff. Second, we determined the impact of these problem behaviors on staff burden. Level of severity of a behavioral problem was highly correlated with the distress to staff (rho =.70; p < .001). Table 2. lists the mean severity and mean level of distress to staff for each behavioral category. Thirdly, we investigated whether there are predictor variables, which could be easily assessed by clinicians at admission, which may place older adults at increased risk of developing behavioral problems in this setting. To do this we conducted a regression analysis. Due to the limited number of patients with a history of substance abuse, we excluded substance abuse from the analysis. Thus, we conducted a multiple regression analysis that included 7 predictor variables: age, years of education, living arrangement, ethnicity, psychiatric history, and performance at admission on the MMSE and the GDS. Our analysis revealed that a statistically significant proportion of the variance of the NPI-Q was accounted for by baseline MMSE performance, with lower scores on the MMSE (more cognitive impairment) being significantly associated with higher ratings on the NPI-Q (more behavioral disturbance). No other significant associations were observed. We also conducted a Receiver Operating Characteristic Curve Analysis (ROC). The ROC procedure examines every predictor variable and their associated cutpoints and identifies the variables with the optimal balance between sensitivity and specificity for identifying those particular patients with the specific outcome of interest (namely, presence of behavioral problems). The result is a decision tree (see Figure 2). For further details regarding ROC analysis see Kraemer . While ROC analysis is typically conducted on large sample sizes, ROC can be conducted on smaller samples in order to assess the first variable which discriminates among the sample and at which cut-point such discrimination occurs. The first and only variable and cut-point isolated by the ROC analysis was performance on the MMSE (chi-square= 4.37, p < .05, cutpoint = 27). 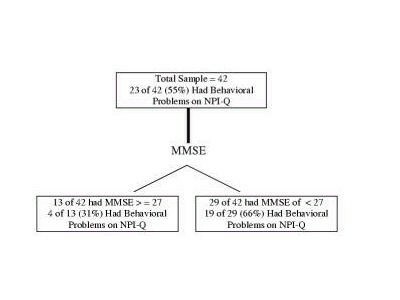 Of 29 patients with a MMSE of less than or equal to 27, 19 patients (66%) exhibited a behavioral problem during hospitalization as rated by the NPI-Q (see Figure 2). Of 13 patients with an MMSE greater than 27, only 4 patients (31%) exhibited a behavioral problem during hospitalization. It should be noted that this cut-point of 27 on the MMSE is considerably above the cut-point of 23 that is commonly used to identify dementia. However, it is interesting to note that in this sample, 12 of 42 (29%) of the patients had a MMSE of 23 or less, and 10 of 42 (24%) patients had an MMSE between 24 and 26. In the current study we found that 23 of 42 patients (55%) exhibited at least one behavioral problem in their first two days of hospitalization. All together, these 23 patients exhibited a total of 51 problem behaviors in the first two days of hospitalization. In particular, anxiety, depression, irritability, and agitation/aggression were the most commonly observed behaviors. Hallucinations and delusions were associated with the highest level of severity and highest level of distress; however, they occurred rarely. Of the more frequently occurring behaviors, nighttime problems was the behavioral category associated with the highest mean level of severity. However, agitation resulted in the highest level of distress to staff. The results find that, on average, the observed behavioral problems are of moderate severity and result on average, in mild distress to staff. While the occurrence of one behavioral problem, in and of itself, may not be a significant burden, the cumulative impact of so many problem behaviors over so short a time span may be very disruptive to staff, and we have previously reported that staff report a large number of behavioral problems in this population . The results of this paper also suggest that the mental status of older adults at admission to hospital is predictive of behavioral problems during their hospitalization. Thus, assessment of the mental status of older adults at admission to hospital may represent an effective way for staff and clinicians to identify older patients who are more likely to develop behavioral problems during hospitalization and who could potentially be targeted for procedures that might reduce the occurrence of such problems. This finding is in line with the literature, which suggests that individuals who have cognitive deficits are at greater risk for exhibiting behavioral problems in long-term and other non-acute settings . Investigators have found lower MMSE scores at admission predictive of functional decline following acute medical illness and hospitalization . Additionally, cognitive impairment is associated with the development of delirium during hospitalization, which in turn, can result in a variety of behavioral problems . However, in these studies, patients usually had cognitive impairment indicative of dementia, whereas the current study suggests that among hospitalized elderly, a MMSE score of less than 27 places a patient at increased risk of behavioral problems. It may be that a patient with even the mildest degree of cognitive impairment is more vulnerable to any negative impact of hospitalization on behavior. Alternatively, this may simply reflect the fact that in our ROC analysis we utilized a broad criterion for specifying the occurrence of a behavioral problem, with a rating of one or higher on the NPI-Q considered indicative of the presence of a behavioral problem. However, as mentioned, the occurrence of even one behavioral problem can be disruptive. Additionally, as our multivariate analysis reveals, increased ratings on the NPI-Q were associated with lower scores on the MMSE, such that more cognitively impaired patients exhibited a greater quantity and/or severity of behavioral problems. This relationship between mental status and behavioral problems is all the more important given the observation in the current study of a large percentage of patients with a MMSE of 23 or less at admission, suggesting that a greater proportion of older hospitalized elderly may be suffering from cognitive impairment than has been traditionally recognized. Prior studies suggest that approximately 5 to 12% of older adults admitted to general hospital units have dementia [28, 29]. However, in the current investigation, 29% had a MMSE of 23 or less which is indicative of dementia, although only four of these patients had a documented diagnosis of dementia. One of the few studies that investigated cognitive impairment in an acute care setting observed a similar prevalence. Hickey et al., in an investigation of 112 older patients in the acute care setting, average age of 74.7, found that 22% had an MMSE of 23 or less . Overall, this suggests that a significant proportion of older hospitalized adults are cognitively impaired, and thus greater proportions of hospitalized older adults may be at increased risk for behavioral problems. However, the current study had several limitations, which impact the interpretations that can be made and which future studies might address. In addition to the small sample size, the data in this paper are limited to only the first two days of hospitalization, and this significantly impacts the prevalence of behavioral problems in the current study. It may be that patients are more likely to exhibit behavioral problems at this time, but it also is likely that patients who did not exhibit behavioral problems in the first two days may do so later in the course of their hospitalization. Therefore, it is not clear whether we would observe the same relationship between our predictors and the occurrence of behavioral problems if we included all episodes of behavioral problems exhibited during the full course of each patient's hospitalization. Ideally, future investigations of this issue would assess for the presence of behavioral problems each day during hospitalization. As the current study was conducted at Veterans' Affairs hospitals, the male-only sample further limits the interpretation of the results to the male gender. Some studies have suggested that men are at increased risk for exhibiting behavioral problems , and this may have significantly biased the prevalence of behavioral problems in our investigation. Additionally, we included a limited number of predictors in the current study. Although we identified predictors that could be easily obtained or assessed at admission, other variables, including diagnosis, acuity of illness, co-morbidities, pain, and type and dose of medications, may also be associated with the development of behavioral problems in this setting. However, we did not have a sufficiently large sample size to investigate these variables given their significant heterogeneity across the patient population in this study. Future studies of larger numbers of hospitalized elderly adults could investigate a broader range of predictor variables. Also, several of our predictor variables were based upon self-report, and such self-report may be influenced by cognitive status. Indeed, even depressive symptoms, as assessed by the GDS, may be under-reported by those participants with cognitive impairment, although we observed no association between mental status and GDS. Since clinical staff can have limited shifts and care for more than one patient at a time they may under-report certain behavioral changes, particularly apathy and depressive symptoms. Alternatively, distress responses to behavioral problems may vary among staff, and may be influenced by such factors as staff experience, or whether or not the clinical staff member has a background in psychiatry or geriatrics. The current study did not investigate these issues, but future studies are needed to explore other factors impacting staff distress responses to behavioral problems. Overall, however, the current study suggests that a significant proportion of older hospitalized patients exhibit behavioral problems, and these problems are distressful to staff. Additionally, our findings indicate that a large percentage of these patients are cognitively impaired and that lower mental status in these patients places them at increased risk for developing behavioral problems during hospitalization.